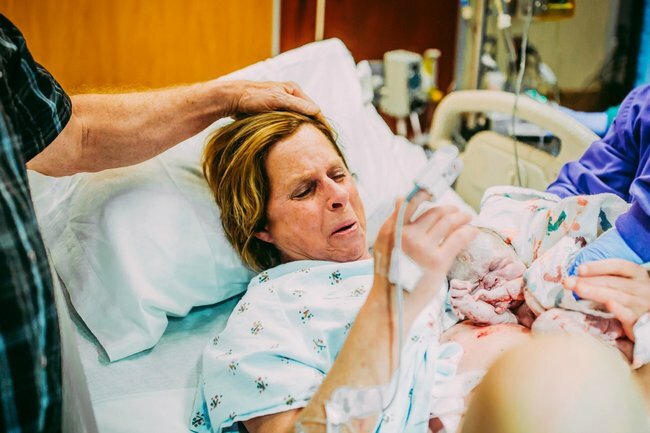 61-year-old grandmother gives birth to her grandchild. 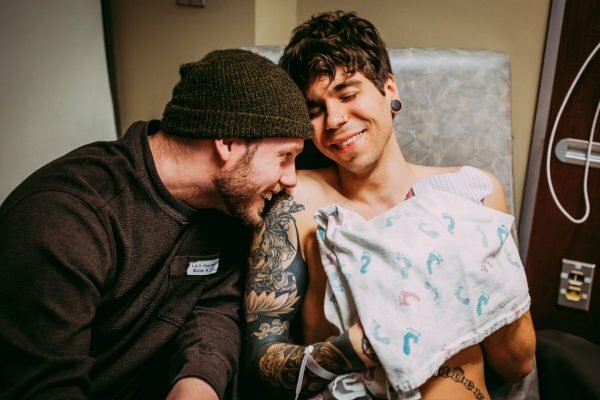 When Matthew Eledge and his partner Elliot Dougherty decided to start a family, they knew they would need a surrogate to carry their child. But in the end, they didn’t have to look very far to find one. After telling Matthew’s mother, Cecile, that they were ready to have a baby, the 61-year-old offered to carry her grandchild. Following a lengthy process of tests and doctor’s appointments, Cecile was finally given the clearance to go ahead with the pregnancy as she was put on hormones to begin menstruating again. Matthew Eledge and his partner Elliot Dougherty watch as Cecile gives birth. Image: Ariel Panowicz Creative. "It was natural instinct." Image: Ariel Panowicz Creative. Using an egg donated by Elliot&apos;s sister Lea and Matthew&apos;s sperm, the embryo was implanted into Cecil&apos;s uterus. On the very first try, Cecile fell pregnant. Now, after a tough pregnancy filled with bouts of morning sickness and blood pressure spikes, Cecile has finally given birth. On March 25, Cecile gave birth to her son&apos;s baby girl, Uma Louise Dougherty-Eledge. 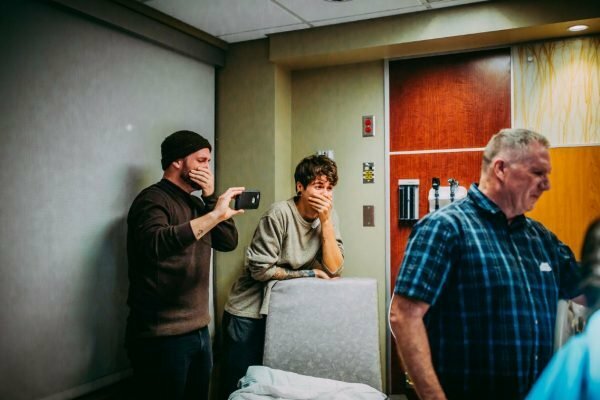 Last week, photographer Ariel Panowicz was in the room alongside Matthew and Elliot as Cecile gave birth. In the past week, Ariel&apos;s photographs and the incredible story behind them has gone viral. Matthew Eledge and Elliot Dougherty with their daughter Uma. Image: Ariel Panowicz Creative. 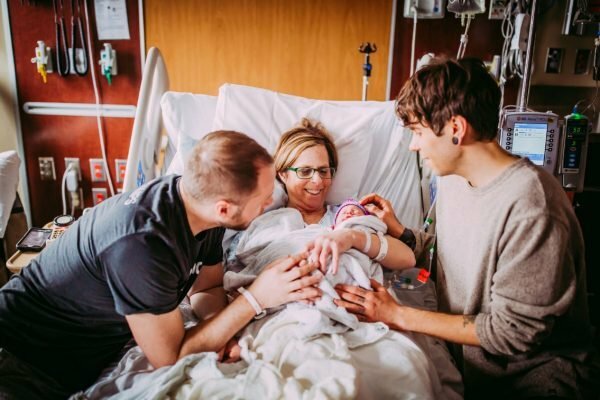 "It&apos;s amazing to see how much love and support the world has shown the unique family and how connected they feel through the photographs," Ariel told Mamamia. "I think it&apos;s a beautiful reminder to all of us just how powerful love can be." Ariel, who also photographed Matthew and Elliot&apos;s wedding and maternity photos, described the birth of Uma as a "magical" experience. "The strength and poise that Cele demonstrated at 61 years old while giving birth was truly a sight to see," she told Mamamia. "She was so calm and had the energy of a true warrior." 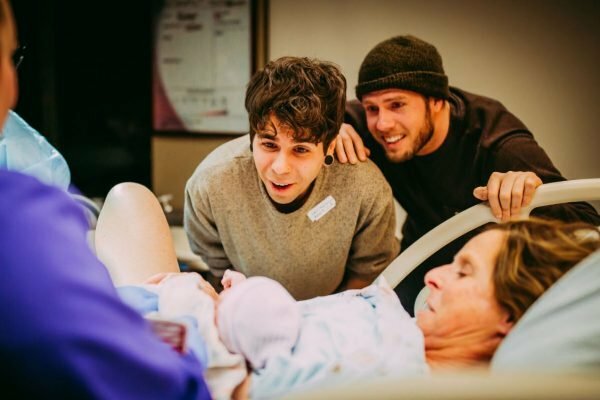 "The look that Cele have her son and son-in-law when they locked eyes with their baby girl for the first time was enough to drain every dang tear from your body." Speaking in a hospital issued statement, new father Matthew shared that he is "so thankful" with how the process worked out. "We are really grateful that both Uma and her grandma are here, happy and healthy. For the time being, we&apos;re just going to relax and enjoy this moment," he said. Speaking to the NY Post, Matthew also noted that a lot of people have been confused about the surrogacy. "As gay men, we&apos;re so lucky to be having children at a time when people are actually celebratory of our relationship and of us being parents, and also at a time when technology allows us to have this baby, with some of Elliot&apos;s genetic material and some of my genetic material." 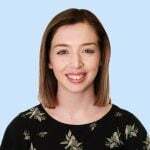 You can find out more about Ariel Panowicz on her website or follow her here on Instagram.